This Cambodia small group local experiences tour gives you the chance to see fascinating Cambodia and as the roads of the Khmer nation have been greatly improved this trip is no longer the arduous adventure it once was. So now you can experience some of the friendliest people in Asia, try new cuisine and have a relaxed holiday all in one. Starting and finishing in Bangkok means a taste of the Big Mango also. Yes! Angkor Wat and the Phnom Penh attractions are included but it will be the lesser known places that will enthral you even more. ACCOMMODATION = (3 star hotels x 11 nights, 2 star hotel x 2 nights). VISITING: BANGKOK - PHNOM PENH - PURSAT - BATTAMBANG - SIEM REAP, (Angkor Wat). Angkor Wat, (two or three hours at sunset followed by a full day). Killing Fields and Tuol Sleng (S21) Genocide Museum, (half day). 14 meals included as per itinerary. Tonight our Cambodia small group adventure tour will stay in; BANGKOK - Our Cambodia small group tour officially starts when you check into your Bangkok riverside accommodation. A welcoming dinner will be had in the evening. If you arrive early enough your free time could be spent visiting the enormous Chatuchak weekend market and/or, Wat Phra Kaew & the Grand Palace, Wat Pho, Wat Arun, MBK or Siam shopping centres. Or our pick is to take a public transport boat ride with the locals to avoid the traffic on the Chao Phraya express to some local markets in Nonthaburi for a real local experience. OR? Maybe just lay back and have a traditional Thai Massage. A month in the capital would not allow enough time to see everything. D.
Tonight our small group Cambodia tour will stay in; PHNOM PENH - As this is a Cambodia tour we will get there fast with a short international flight to the capital Phnom Pehn to let it all begin. The hectic but fascinating city is a great place to start our cultural and historic exploration. Maybe try one of the national dishes of Amok for your first Kmer meal. Wash it down with a top quality Angkor beer at budget prices. Happy hour on Sisowath Quay is just one great place for all this. B.
PHNOM PENH - A day to try and fully comprehend the short but brutal rule of the Khmer Rouge. A visit to the Killing Fields of Choeung Ek where the Khmers have made fantastic efforts to come to terms with their recent history. Then to the just as infamous S21 which is now Tuol Sleng Genocide Museum. Here you can view 100's of black and white photos Pol Pot's regime took both before and sometimes after torturing his victims. This experience will stay with you forever. You will come away with far more compassion and concern for your fellow man. B.
PHNOM PENH - A free day to explore the capital of this friendly and interesting country. Maybe buy a T-shirt for a dollar or three in the Central Market where, as in all Asian markets, bargaining is mandatory. Other sights and activities include the Royal Palace and Silver Pagoda, National Museum, Wat Phnom, Wat Montrei, Wat Ounalom or Independence monument just to name a few of the many attractions. A cooking course maybe at Cambodian Cooking Class. Shoppers won't be left out either. Options include The markets of Psar Thmei, Psar Tuol Tom Pong,(Russian Market), Psar O Russei, Psar Chaa and Psar Olympic. Art galleries and other shops are scattered around the main tourist area of Sisowath Quay by the river. The Cambodian Craft Cooperation has some great silk, silver and pottery products among other things. There are a number of other charitable shops also. In between sights you can sup on some great food. A few of a number of restaurants where the profits go to worthy causes are. Cafe 151; Friends; Lazy Gecko Cafe, Le Rit's, Cafe, Yejj and Romdeng with the latter serving up lots of local Khmer specialities including the now famous deep fried spiders. This is also another chance to put the word vacation into action. Possibly in the atmospheric riverside corner bar for a happy hour drink. B.
Tonight our Cambodia travel tour will stay in; PURSAT - A short bus trip today will see us in the far less visited Pursat to experience a real laid back provincial capital. For those in the market, a life-size marble statue may be your souvenir of choice from Pursat. Other than that strolling around this quiet destination is the thing to do. B.
PURSAT - A free day to experience the local way of life or for the more active it may be possible as an optional extra of a visit to the floating village of Kompong Luong. At approx US$20.00 per person, naturally, by boat, it would see us in this watery village thirty kilometres from Pursat. Visits are only possible when water levels allow it though. B.
Tonight our Cambodia adventure holiday tour will stay in; BATTAMBANG - A relatively short bus trip today will see us in Cambodia's second city of Battambang. And what a comparison to Phnom Penh. This is the chill out capital of Cambodia. Less traffic chaos, to begin with, makes it the perfect place to explore the old French architectural buildings. Some of the best coffee anywhere and more great food with the Eden cafe just one worth a mention for dinner and a glass of red. Lunch in the local market beside our accommodation with the locals a possibility also. Battambang really is a lesser known super highlight of Cambodia. Not to be missed. No meals. BATTAMBANG - A free day to explore, eat and/or relax by the pool. Some of the attractions include the historic train station minus any trains, the historical Governors Residence from the early 1900s or the Battambang Museum which houses some lintels from the Angkor period among other things. B.
Tonight our Cambodia adventure travel will stay in; SIEM REAP - Another medium day's travel today will see us in Siem Reap the stopping off point to the Angkor Wat temple complex. Late afternoon our driver/guide will take us for the sunset views of this amazing temple complex. 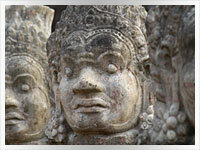 B.
SIEM REAP - A full day by van or car with a local guide to explore the majestic and mysterious spectacle of Angkor Wat. 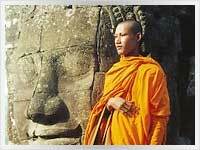 Apart from the main Angkor Wat temple complex, you will also visit the Bayon, Tha Prohm and Angkor Thom. B.
SIEM REAP - A free day to wander around sleepy Siem Reap. Many options on meals today from French to Mexican. But a food market with the locals is the place to get that, "save the best till last", meal of Amok. The Angkor National Museum or the local market for that Angkor souvenir are just two places, to begin with, today. Lots of shopping opportunities now that tourism has arrived. Artisans d'Angkor has a shop selling various pieces relating to local culture. Shops that benefit the blind, disabled and other worthy causes include Krouser Thmey, Nyemo,Rajana, Rehab Craft, Centaurs d'Angkor and Tabitha Cambodia. These shops sell a variety of goods which include silk products, arts and craft, clothing, wallets, bags and the like. B. NOTE: If you want to continue exploring some of the lesser known temples of Angkor that can be arranged as an optional extra on arrival. Tonight our Cambodia small group tour will stay in; BANGKOK - Our group travel tour will have a long but interesting day as we return by bus to Bangkok via the Poipet/ Aranya Prathet border crossing on the much-improved roads. B.
BANGKOK - A last free day in the city of angels to sightsee, shop or just relax by the pool. Traditional Thai or foot massage perhaps? Your tour coordinator will help you decide which way you want to head today. The big Mango offers a multitude of choices. A farewell dinner will be had in the evening. B. D.
Our Cambodia small group adventure tour is officially over when we check out of our Bangkok accommodation. An airport transfer is included. B. We had some soft adventure as well as plenty of free time to relax with only one really long travel day. Plus great food and drink that also help make for a great vacation and some real-life local travel experiences. P/P, T/S, land only; Includes flight from Bangkok to Phnom Penh.